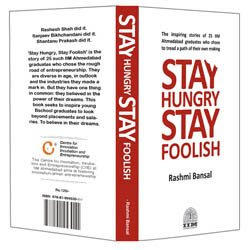 Lakshman Srikanth - Blog: "Stay Hungry Stay Foolish"
Recently I had been to Sapna Book house,Jaynagar and I accidentally came upon this amazing book - "Stay Hungry Stay Foolish" written by Rashmi Bansal. the book talks about 25 Indian Institute of Management(Ahmedabad) graduates who started their own Companies. These entrepreneurs did not plan to take this path but when opportunity knocked they seized it. Their stories go on to show that you don’t have to be ‘born with it’, you can develop an entrepreneurial bent of mind at any age. These individuals are using entrepreneurship to create a social impact. Or as a platform for creative expression. Overall the book shares the challenges faced by successful Entrepreneurs in India and how they tackled it and made it to the TOP . It is a good read for budding Entrepreneurs and Start-up Enthusiasts. It is rather interesting for me to read this blog. Thanks for it. I like such topics and anything that is connected to this matter. I definitely want to read a bit more on that blog soon.